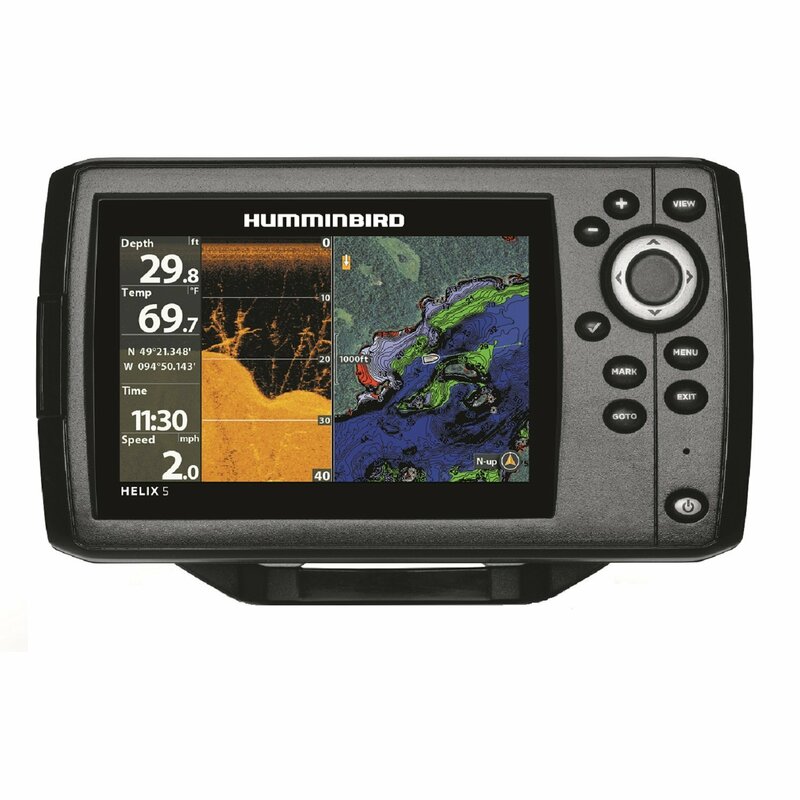 Garmin 60CS | Another unbiased Garmin portable GPS review and more marine electronics. The Garmin 60CS handheld shares all the functionality of its 60C brethren plus has both a built-in electronic compass and barometric altimeter. These two added sensors get this handheld the “S” designation. Eight pushbuttons and a rocker switch are located below with function labels clearly marked on the case front panel. The off/on pushbutton resides on the top of the unit adjacent to the antenna. We found it awkward to hold and operate this Garmin portable GPS with one handmainly because of the small pushbuttons and their location near the bottom of the case. The 60-series units utilize the latest version of Garmins handheld GPS software and interfaces with the user through five main pages. The Satellite page displays tracked satellite location and signal strength, battery status, present position in latitude and longitude as well as position accuracy in feet. Three navigational pages follow with each press of the Page button. First youll find the Trip Computer page which displays either three or eight user changeable data boxes. Next comes the Map page, here you can display a full page map or add up to four data boxes, again all user selectable. The last of the navigational pages is the Compass page. Half the screen space is used by a large compass rose and the other half by either three or four data boxes. Again, the user can select the data to be displayed in the boxes and either degrees or cardinal headings for the compass. In the Garmin 60CS the compass display is driven by the internal electronic compass and provides information even when the unit is stationary. It works much like a handheld wet compass. The unit must be held level and steady to get accurate readings. In the non electronic compass equipped 60C model compass information is supplied by the GPS receiver and only accurate when the unit is moving. Another page button push on the 60CS takes the user to the altimeter page. This page can display altitude and barometric pressure. Only the barometric pressure reading has any real use for boaters. The final page is the Menu page, it leads you to one of 16 other lists or sub-menus including Tracks, Routes, Setup, Calendar, Calculator, and others. On thing we dont like about the 60-series is the lack of tide prediction tables or buoy data. A 2.6-inch (diagonal) 256-color TFT screen with a resolution of 160 x 240 occupies the upper two-thirds of the case front. This high-res screen makes the edges of small fonts and circles smooth to the eye. There are no pixilation issues here. We rated daylight viewability very good. We found the night lighting on this unit to be fairly sophisticated for a handheld unit. It has a 20 position slider to set brightness for the screen and on/off switching for the pushbutton backlighting. Access to the battery compartment, data port, external antenna jack, and USB port are all located on the rear of the case. The 60CS has 56Mb of internal memory to store downloadable data like charts. It can store up to 1000 waypoints and as many as 50 routes. The warranty period is one-year. BEST PRICED Handheld GPS HERE. We really like the Garmin 60CS for its excellent screen and decent software.